Have you found that some of your best photos lately have been the ones you’ve captured with your phone, not with your “real” camera? Me too. For example, I snapped this photo a few nights ago and uploaded to Instagram. 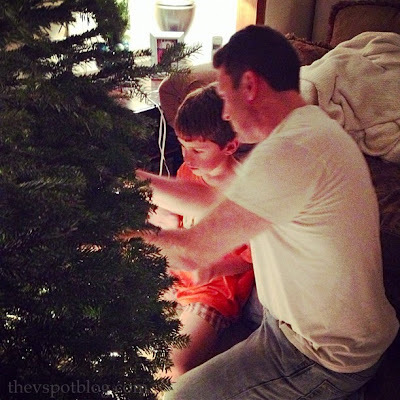 Handsome Hubby showing Grant how to put the lights on the tree. I love it, and would love to get it framed. 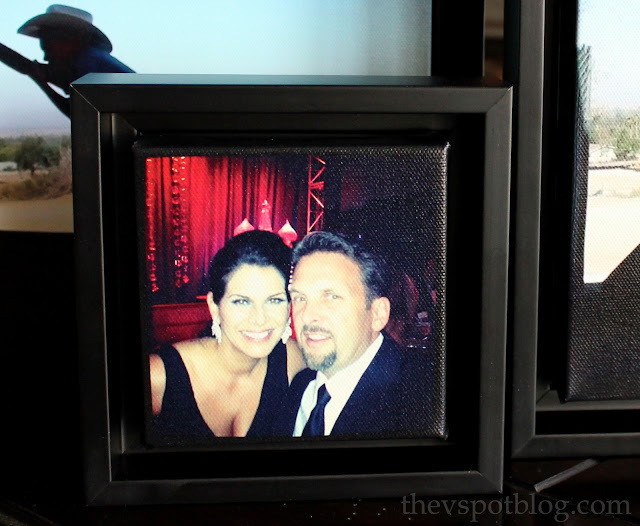 I recently got the opportunity to order some canvas photo prints from SnapBox. This was the first I had heard of SnapBox, and I have to tell you that I am IN LOVE. In love, I tell you! These are fantastic! I was out of town and away from my computer when I needed to order the prints. You know what…? I ordered them from my phone. You know what else? They practically beat me back home! I think they arrived within 4 days of me placing my order. First of all, I was very impressed with the packaging. I’m giving these as gifts, and I always worry about what condition the item will be in upon arrival. These were thoughtfully and securely packaged and they were in perfect condition. Look at how cool the texture of the canvas is! I love this photo of Grant. My mom actually took it with her “dumb” phone (as she calls it.) Grant had been visiting them for the weekend and they were at a rodeo. She looked over to discover him trying to shimmy up a pole in his cowboy boots and hat, just a silhouette against the blue sky. After snapping the photo, she sent it to me as a text. We were all in love with it. I ordered an 8 x 10 and a 9 x 9 photo… one for Grant to give to my parents, and one that I am giving ME because I love that shot so much. Chances are, if my mom had had a “regular” camera with her, she probably would not have been able to capture that moment. Phone cameras mean we are more likely to be in the moment without missing the photo op. This photo? It’s for Handsome Hubby. We went to a big, black tie event a few months ago and he used my phone and snapped this self-portrait. He has mentioned several times how much he liked the photo, so I thought it might be something he would like for his office. At the time, I uploaded this photo to Instagram. Here’s another thing that’s really cool about SnapBox. They have a frame size (5×5) that’s ideal for Instagram and you can even email them the photo directly from the app! The prices and selection are great. SnapBox canvas prints were featured in People StyleWatch Magazine’s “8 Great Ideas $25 & Under!” That is great news, especially during the holiday season when we’re all trying to give fabulous and meaningful gifts without going into hock to do it. Prices range from $10 to $25! So cool! This is great VIc. I take more and more spontaneous pics with my phone and they’re some of my faves. I do have a picture in mind, actually there are lots of pictures that I could use. I would keep one for me and then share the others with the grandparents. I have a picture in mind, and I would keep one and share with my daughters. Love this idea! I have so many pics on my phone that I love…it will be hard to choose! That’s neat! Going to check it out. Wedding photo and son’s photos – keep it for us! How cool! I have a photo of my boys that I’d love to have printed for my hubby’s office. I do have a photo in mind…the grand-dog from a Thanksgiving visit. The gift would be for my daughter. She LOVES that dog! Very cool! I’d be selfish and probably do our family pictures! I love holding onto memories!! I would choose a recent photo of my boyfriend and I for his office! he hardly has anything personal in there right now! Very cool idea–I’d not heard of these before but sounds like fun to do! Snapbox is awesome! Beautiful photo of the two of you – love your dress!! How fun! I love that you can do instagram shots! I have a couple in mind! No particular one in mind but I know I can find something! I would give a canvas to my mom. I would get our engagement pictures on the canvas, since we have full rights to our pictures we can get them printed anywhere! We would keep it so that we could share it with our family! These are cell phone pics… no way! That is amazing! !